​We teach sailing to young people who would otherwise never get the opportunity. For over 20 years that mission has not changed. Increased our participant capacity to 40. Our new location is a terrific setting to teach young people to sail. It is easy to access, safe and it allows us to continue the transition to model our program after other junior sailing program and including racing. For the coming year we are working on yet another transition for the program. We see an opportunity to increase the reach of the program to a broader community. Look for more on that next year. ​Our mission, plans and results would not be possible without our outstanding sponsors, instructors and volunteers. Words can’t express my gratitude for the contributions of GPYNEF and FofDR to make 2018 a successful season. ​Challenge the Wind Youth Sailing Program has been in existence since 1994. It was founded by the ​Grayhaven Sail Club of Detroit to teach sailing to young people who would not otherwise get exposure to the sport. ​Although our approach is "Having Fun While Learning to Sail" we take advantage of the content to stress leadership, problem solving, team dynamics, science and local marine ecology, that are inherent in sailing. 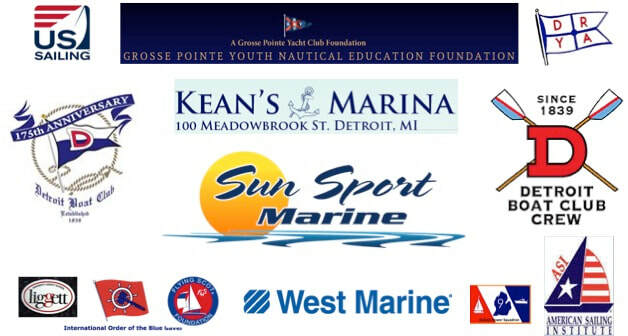 We are a non-profit 501 c 3 and members of the Detroit Regional Yacht Racing Association and US Sailing. ​Challenge the Wind is governed by a board of directors. Click this link for more information on Grayhaven Sail Club Detroit.